In times of cost pressure and high quality requirements, mobile hardness testing represents a fast and, most of all, an economic complement to stationary hardness testing within the modern production process. The application possibilities are manifold this applies both to large and to smaller components and in particular to difficult to access positions. Two different physical methods are especially acknowledged in practice: the static UCI and the dynamic rebound hardness testing method. This article does not only discuss the fundamental operational principles of these two methods by means of practical examples but a new test method is also presented which reshapes the field of mobile hardness testing. A mobile optical hardness testing method was developed with the Through-Indenter Viewing (TIV) method enabling automatic determination of indentation size for the first time by measuring the diagonal lengths through the Vickers diamond under load. An optical system including a CCD camera is used to view through the indenter and therefore, determine the hardness under load. As Vickers hardness is defined as the quotient of test load and size of the diamond indentation, it can be directly determined for the corresponding test load on the basis of the diagonals determined according to the TIV method. 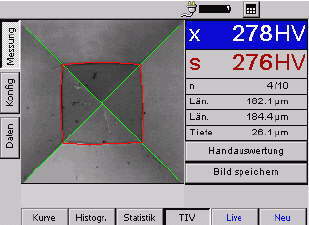 The live picture of the indentation on the LCD screen enables to immediately check the quality of the diamond indentation and consequently conclusions to be drawn with regard to the reliability of the measured value. By measuring the indentation through the diamond under test load, the TIV method is independent of the test material and therefore opens up numerous new applications. The physical method based on hardness testing according to Vickers enables measurement of hardness on various materials without the necessity of additional instrument calibration. In relation to metallic materials, the hardness was (and still is) a largely discussed topic among metallurgists, engineers, and materials scientists. It is therefore no wonder that a large number of different definitions exist for the term hardness. Wear resistance, deformation behavior, tensile strength, as well as modulus of elasticity are, among others, associated with the term hardness. Hardness testing is almost nondestructive and serves in many cases for the determination of characteristic quantities or parameters which can be used for distinguishing and describing materials. Hardness values give e.g. information about the mechanical properties (i.e. strength) of the material at low cost. In general, the technical hardness is to be understood as the resistance of a material to the penetration of an indenter made of a harder material. However, to have a technically useful hardness value, an exact description of the method must be defined if one were to compare the numerical values obtained with one another. However, if the numerical value depends on the method, then it's perfectly correct to conclude that the hardness in question is no physical quantity but that it must be a characteristic quantity. Hardness is consequently no fundamental quantity of a material but the materials response to a certain load or test method. A hardness value is then calculated from this response of the material to the specific test. This means that, depending on the test method, other numerical values are determined which are defined or characterized by the shape and material of the indenter, as well as by the type and size of test load. In these methods, the load is applied statically or quasi-statically. The hardness value is defined by means of the permanent test indentation after removing the test load as the quotient of test load and the surface or projection surface of the permanent indentation (Brinell, Vickers, Knoop). 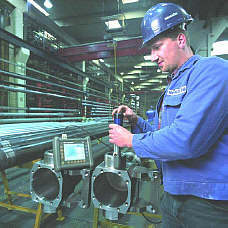 When testing according to Rockwell, hardness is determined using the permanent indentation depth of a body induced by the test load. As opposed to the static methods, the load is applied by propelling a body (indenter) onto the surface hardness is determined by the indenters energy loss. Within the production and assembly, hardness of materials or components is mainly tested for two reasons: Firstly, in order to define characteristic features of new materials and, secondly, for reasons of quality assurance by conforming to the required specifications. 2.3.How is hardness testing carried out? In the case of conventional hardness testers, such as Rockwell, Brinell, or Vickers, it is in principle necessary to bring the test object to the instrument. As this is not always possible for practical and, most of all, also for geometrical reasons, small and portable hardness testers were designed enabling a fast on-site test on the component. Various methods are applied in these cases. The most successful mobile hardness testers are the ones using the UCI and the rebound methods. In the case of the Ultrasonic Contact Impedance (UCI) method, the hardness of a material is determined on the basis of the size of the test indentation left behind in the material by a Vickers diamond after applying a defined load, similar to that of hardness testing according to Vickers. Unlike the stationary instruments, the diagonals of the indentation are not optically evaluated with the UCI method but its surface area is indirectly electronically detected by determining the shift of an ultrasonic frequency. Fig 1: Schematic structure of a UCI probe. A UCI probe mainly consists of a Vickers diamond fixed to the end of a metal rod (please see Fig. 1). This oscillating rod is excited by piezoelectric crystals to a longitudinal oscillation at a resonant frequency of about 70 kHz. If the defined test load of the UCI probe used, applied via a metal spring, acts on the test material, there is a shift in the frequency of resonance. UCI hardness testing is based on the relationship between the frequency shift and the hardness of the material under test. The frequency shift determined by means of the UCI probe is proportional to the contact surface of the Vickers diamond with the test material and consequently to the size of the test indentation created by the diamond under test load. The softer the test material, the deeper the diamond penetrates. On the other hand, a large contact surface leads to a high frequency shift. Different to the conventional Vickers test, the diagonals of the test indentation are not optically determined for the hardness value after removing the load, but its surface area is electronically detected in a matter of seconds. When applying the rebound or Leeb's method, the hardness of the material is measured indirectly by means of the loss of energy of an impact body at the moment it strikes the test material. The impact body, with a spherical carbide metal tip, is accelerated by spring force toward the test surface at a defined speed. Due to the impact and to the plastic deformation of the material surface as a result of it, the kinetic energy of the impact body is reduced so that the latter is impelled back in the oppo site direction at a lower speed. The impact and rebound speeds are measured inductively in a noncontact mode (refer to Figure 2). the HL value can be determined on the basis of the induced voltage measured before the impact (VA) and the value determined after the impact (VB), taking the change of sign and the factor 1000 into account. Fig 2: Schematic structure of an impact device. However, the determination of the velocity ratio is not quite trivial if the demands on the accuracy are high because the curve shape of the induced voltage is affected by the active acceleration due to gravity and by friction of the impact body during the flight. This dependence on the inclination of the impact device, or on the angle at which the measurement of hardness is carried out, calls for the input of correction factors on previous hardness testers operating according to the rebound method in order to compensate for gravitational force and to avoid incorrect measured values. This potential source of errors is eliminated by a patented method developed by AgfaNDT/Krautkramer. A manual input of directional correction factors is no longer required, the angle of inclination of the impact device is automatically taken into consideration. The nondirectional instruments from the DynaMIC and DynaPOCKET series optimize and therefore also simplify the application of the rebound method. Potential errors are eliminated, a documentation of test results according to ISO 9000 guidelines is made considerably more easy. The two different methods were implemented in a common instrument concept by the hardness testers MIC 10 and DynaMIC (Figs. 3 and 4). This concept enabled many advantages of the UCI method (MIC 10) to be applied to the rebound method (DynaMIC) as well. For example nondirectional testing: The rebound hardness tester DynaMIC recognizes the direction of impact on its own by means of its patented signal processing and makes the correction automatically. The easy and fast calibration feature, as is possible with UCI tests, was also adopted in the DynaMIC; standard tables for certain materials are already predefined, and the instrument can be calibrated to any other material in a matter of seconds. Besides the possibility of displaying the test result according to the usual hardness scales (conversion into other scales), the standardization (ASTM A 95600) of the rebound method has mainly ensured that this test method has become more widely accepted in the field, especially in the case of rebound hardness testers DynaMIC and DynaPOCKET. 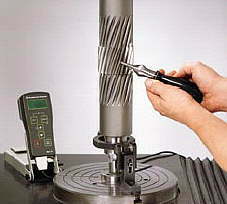 Fig 3: Hardness testing using a UCI instrument (MIC 10) on the tooth flanks of a pinion shaft. 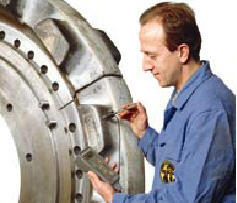 Fig 4: Hardness testing using a rebound hardness tester (DynaMIC) on the drive wheel of a hydraulic excavator. TIV is a portable instrument for optical hardness testing according to Vickers under test load. An optical system including a CCD camera enables viewing through the diamond (Through Indenter Viewing). This new method makes it possible for the first time to directly watch the process of the Vickers diamond penetrating the test material on the display. Thanks to the optical method of measurement, the TIV technology enables hardness testing on different materials without any additional calibration. Moreover, the static application of the test load also enables measurements on thin and small objects, as well as on coatings. As soon as the test load is attained, the diagonal lengths of the indentation are determined and converted into a hardness value according to the Vickers definition. This evaluation can be carried out both manually and automatically. The tables according to DIN 50150 and ASTM E 140 are stored in the TIV instrument and selectable from there in order to convert the measured hardness into other scales. The presentation of the indentation or of the Vickers diamond on the display does not only allow to immediately check and analyze the quality of the measured value but to also directly check the condition of the indenter (Vickers diamond). Fig 5: The hardness tester TIV. Fig 6: The practical application. Thanks to the optical hardness testing method, TIV can be used to open up new fields of application for mobile hardness testing in which conventional instruments could not produce any reliable results up to date. 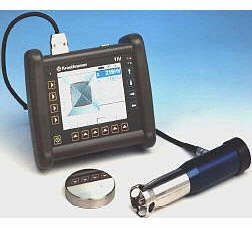 TIV is the first mobile test instrument that does not determine the indentation size of the Vickers diamond and consequently the hardness of the material indirectly but directly: ThroughIndenter Viewing means that one can simultaneously see the indentation of the Vickers diamond grow on the test object's surface while the test load is applied. This is en sured by a special optical lens combination including a CCD camera to digitize the indentation picture. As soon as the test load is attained, the picture of the indentation or of the diamond is transmitted from the probe to the instrument and automatically evaluated. A special software is used and n a first step the edges of the indentation are determined. Finally, the lengths of the two diagonals of the indentation are determined on the basis of the intersecting points with the edges of the Vickers diamond (136° roof angle) displayed on the screen. The average of the two diagonals is subsequently used for calculating the hardness values according to the Vickers definition. The automatic evaluation is not only fast compared to the conventional evaluation using a measuring microscope but subjective effects from the user are also excluded which become especially noticeable in manual evaluation of the Vickers indentation. Figure 7 shows the result of a hardness test using the Through-Indenter Viewing method. Only the optical verification of the indentations shape allows reliable conclusions to be drawn with regard to the quality of the measurement. One look on the display is enough to recog nize whether the measurement has been influenced by the surface quality, the material's microstructure, or by other effects. Fig 7: Hardness testing using the TIV. The indentation of the Vickers diamond is displayed on the screen and automatically evaluated. In addition to the automatic evaluation, the in strument also makes it possible to evaluate the Vickers indentation manually. The edges of the indentation are adjusted by hand in an enlarge ment of the picture on the display. The length of the diagonals is automatically updated, and the corresponding hardness value displayed. The display of the Vickers diamond presents the additional possibility of directly checking the con dition of the indenter. Any defects on the indenter, such as e.g. edge breaks, are identified at once so that incorrect measurements can be avoided from the very start. The results of a test series can be graphically represented as a curve, or even in tabular form, including statistical data (refer to Figures 8 and 9). All the necessary information such as average, single value, or statistical data are dis played or updated during the measurement. Fig 8: Graphic representation of the test results as curve shape. Fig 9: Representation in tabular form of test results including statistical data, such as e.g. range, standard deviation, and minimum or maximum. The TIV enables the mobile and on-site measurement of hardness on different materials without having to carry out any additional adjustments and calibration procedures (refer to Figure 10). Due to the static test load application, the TIV also enables measurements on thin and small parts, such as e.g. coils, sheet metal, etc. 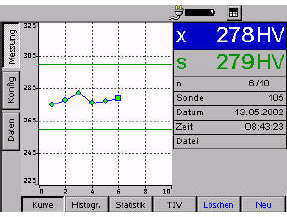 The live picture of the indentation on the display screen allows to immediately analyze the quality of the measurement. The TIV is provided with an automatic evaluation of the Vickers indentation, i.e. the di agonal lengths are determined directly and automatically. 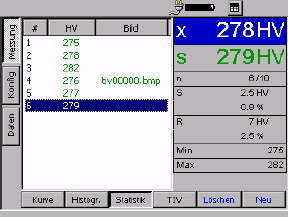 The display of the diamond edges on the screen allows to directly check the condition of the indenter. Fig 10: Hardness testing on different materials using the Through Indenter Viewing method. The TIV allows to open up various new fields of application which were previously not accessible to mobile hardness testers. Hardness tests are not only independent of test position and direction but now also of the test object's material and mass or geometry.